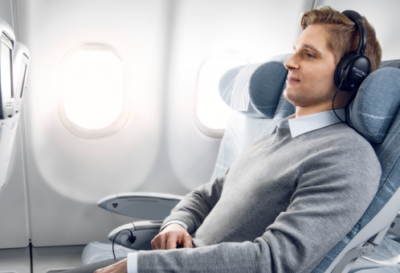 We recently flew with Finnair to Helsinki, you can read our reviews of the cabin, seat and entertainment in our other post, we’re dedicating this post to the inflight food and drinks (a delight). Starting with the pre departure drinks. 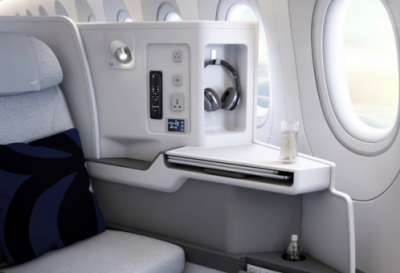 Swiftly after boarding your flight attendant will present you with a choice of champagne or blueberry juice, a Finnair specialty, or a combination of the 2. 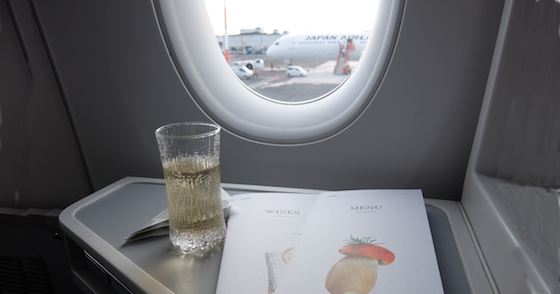 As the rest of the plane continues to board its time to settle into your seat, enjoy your choice of pre departure drink, and make your dining choices. 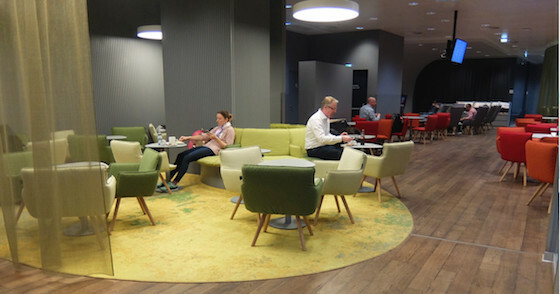 Finnair business class pre departure drink. 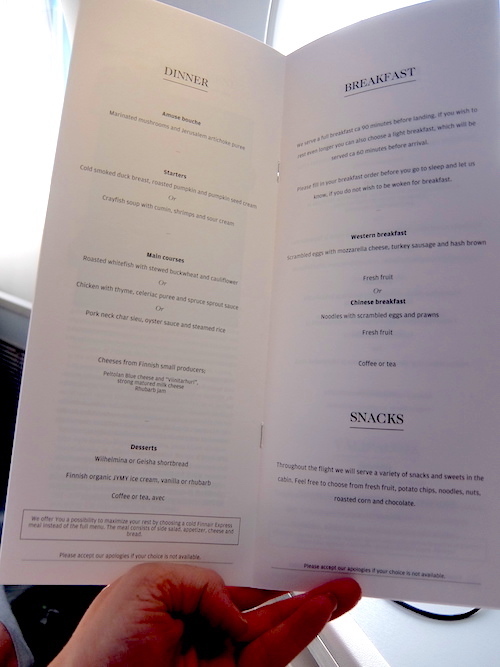 In your seat pocket you’ll find a neat folder containing your menus, including a breakfast pre order form. The breakfast pre order form is a particularly nice touch, your flight attendant will take your breakfast order at the same time as your dinner order. Meaning you get to sleep a little longer and have your breakfast delivered directly to you in the morning. 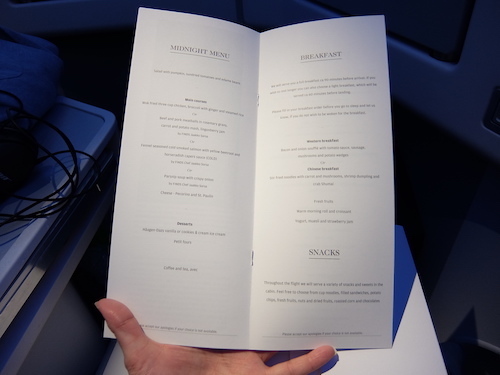 Our first flight was a late night departure, so we were presented with the Midnight menu, a lighter quicker option, rather than the 3 course meal that is served at other times. A smart option from the Airline as after being on the go all day, and already eating in the Qantas Club, we were eager to get to sleep. Although being a lit late night meal, there was still plenty of food served. We chose the cold smoked salmon salad which was remarkably fresh with a light horseradish dressing. The meal was served with an edamame side salad along with a cheese plate and boxed chocolate truffles. 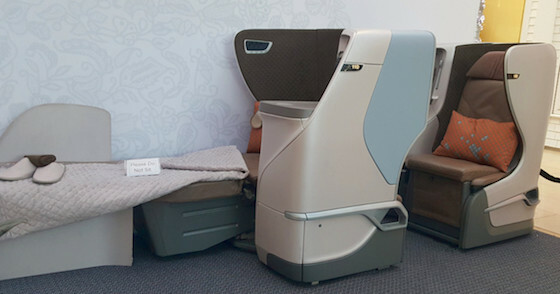 The flight attendants also came around with individual tubs of Haagen Dazs icecream. Cold smoked salmon, served with edamame salad and cheese plate. 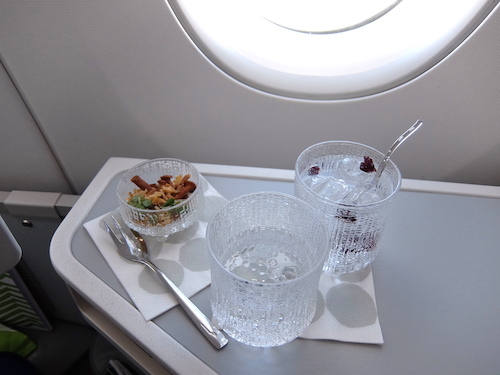 On our return flight we departed Helsinki at 5:25pm and experienced the Finnair dining experience in full. 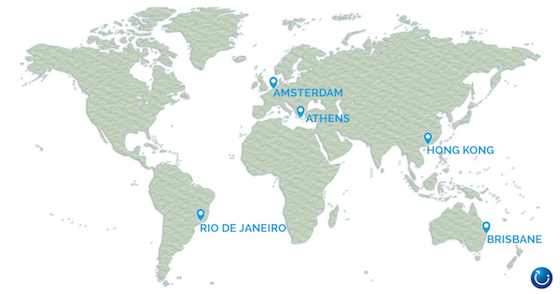 The Finnair full dinner menu consists of 4 courses of restaurant style dining. Starting with an amuse bouche. Course 1: Amuse bouche – marinated mushrooms with artichoke puree. The amuse bouche was a small bowl of a medley of marinated mushrooms served with a Jerusalem artichoke puree. I teamed this with a Finnish specialty Gin and tonic, garnished with blueberries of course. Following course 1, we moved onto starters, a choice of duck breast or crayfish soup. The Finn’s do seafood soup well but after already enjoying some salmon soup in the Finnair business class lounge, I opted for the smoked duck breast, which I matched with a glass of Italian red wine. 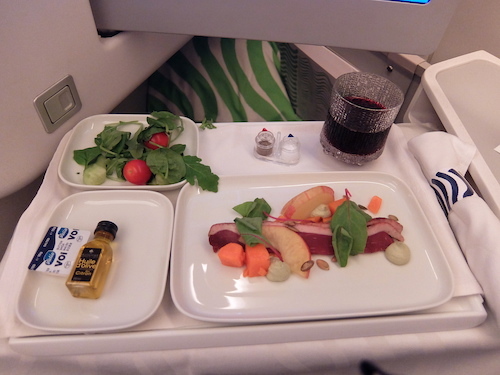 The duck was delicious and came with a side salad (which was a little shaken up due to some turbulence) with citrus oil and your choice of bread. Course 2: starter side salad with citrus oil. Keeping with the restaurant style serving, our starter plates were cleared before being served our main meals. 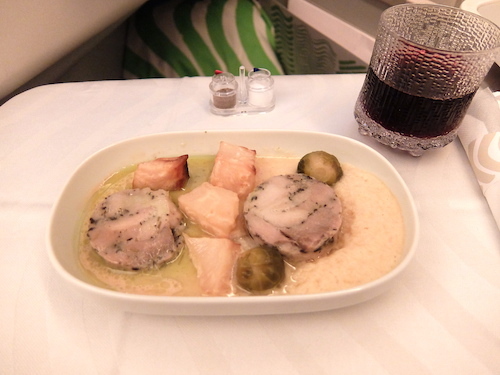 The main options consisted of a choice of Roasted fish, Chicken with celeriac puree, or Pork char sieu. I chose the chicken… along with another glass of red. Whilst not the most photographic dish, the chicken tasted great. It was served in a roulade style anong with potatoes, the celeriac puree and brussels sprouts all packed with flavour. Following main course, we moved on to a cheese course, featuring cheese from Finnish small producers. Course 4: Cheese from Finnish producers. 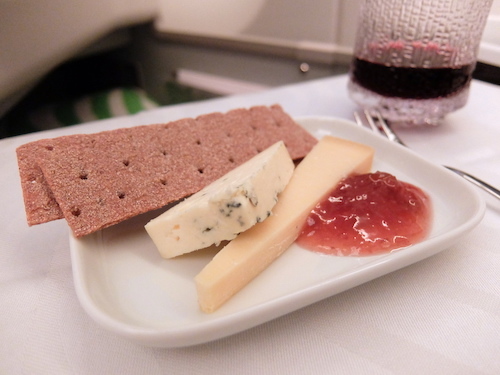 Following the cheese course was the option for a dessert of shortbread or Finnish Ice cream. As tempting as this sounded, I was quite full following the 4 courses so skipped this. 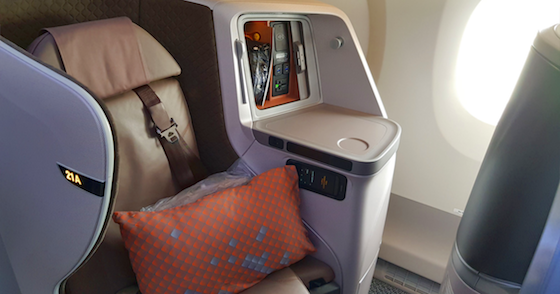 Business class passengers also have access to a selection of snacks throughout the flight including chips, biscuits and lollies. 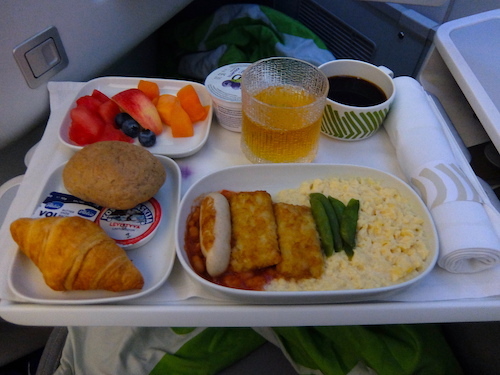 Breakfast onboard Finnair was a choice of Western or Chinese – Scrambled eggs and hash browns or Noodles with prawns. I chose the western breakfast of scrambled eggs, turkey sausage and hash browns. 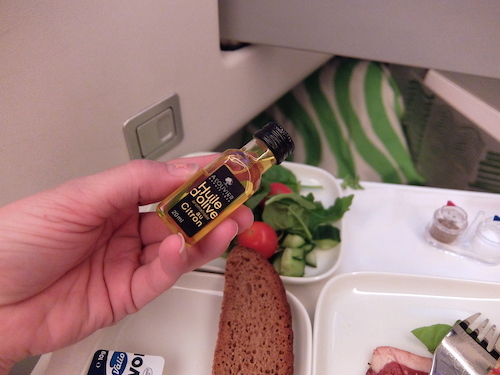 The breakfast, whilst still tasty, was a little more what you expect to find inflight compared to the restaurant quality dinner. The main meal was served with fresh fruit which was very fresh and tasty, fresh croissants and a tub of yoghurt, accompanied by your choice of juice and tea or coffee. 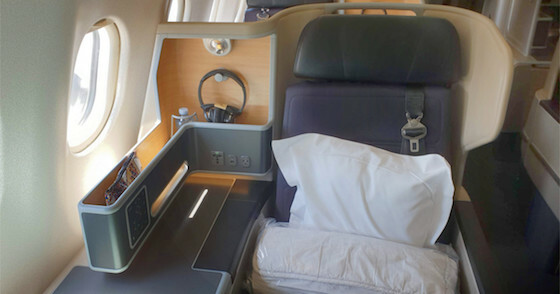 The flight attendants also offered additional croissants and pastries fro anyone wanting extra. 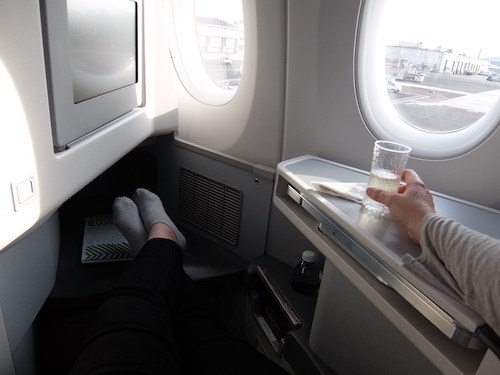 As all of this order was placed at the beginning of the flight thanks to Finnair’s breakfast pre-order system, the morning wake up/pre landing procedure was much quicker and seamless than on other airlines which was a definite positive. 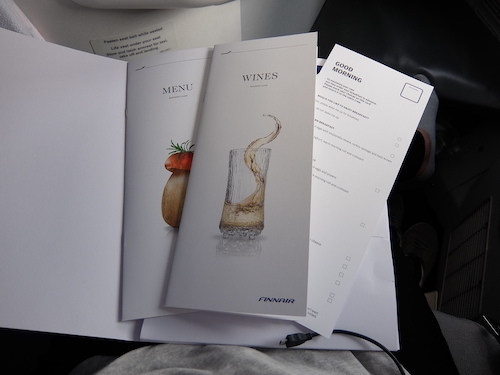 All in all I rated the Finnair business class inflight menu and dining very highly. 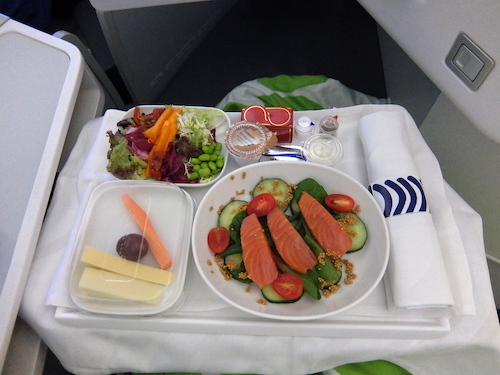 The flight attendants were very professional and helpful, the meals were overall tasty and fresh, the options for swift meals at certain times of the flight were greatly appreciated and the chance to fully enjoy the dining experience and wine list at a leisurely pace when we had time on our side was highly enjoyable.